We offer overland 4x4 Tours of Lesotho. Lesotho isn’t just another country, it is another world! Join us on one of our Overland 4x4 Tours of Lesotho! This is a world that is just begging to be explored either on foot or in the comfortable luxury of one of our Landys. We can take you on a hike up Thabana Ntlenyana (3482m) to summit the highest peak in Southern Africa. Click here to see how we do that. Alternatively, we will take you on a 4x4 drive up the world famous Sani Pass, stopping for lunch and a cold one at the highest pub in Africa. 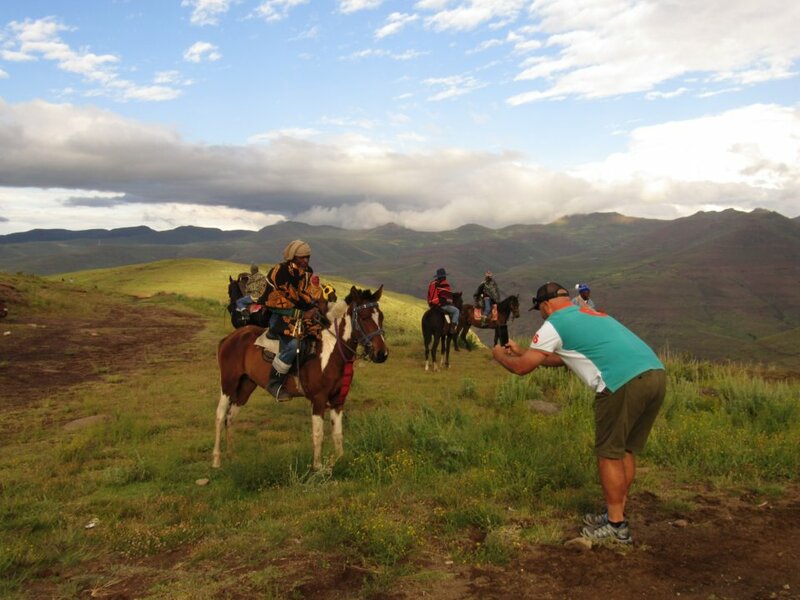 An overland 4x4 tour of Lesotho is an adventure not to be missed. We have 3 strong 4x4 vehicles that you can join us in or drive your own 4x4 vehicle. We do everything else for you including bookings and cooking hot meals. 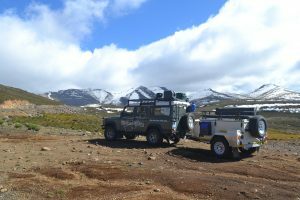 Included on an overland 4x4 tour of Lesotho is a 1 day trip up Sani Pass ... to multiple day adventures which will allow you to really explore and experience Lesotho the Mountain Kingdom in all its glory. We visit Lesotho in the winter to see a special winter wonderland. Don't worry though, we stay in lovely cosy lodges. This trip is usually 5 days long but can be done in just 2 days or even 4 days. We live in Pietermaritzburg so start our overland 4x4 tours of Lesotho from there. After entering Lesotho at Qachas nek we drive to Semongkong. The lodge here is lovely and we can try for a brown trout in the stream below. Nearby is the Malatsunyane falls. Certainly worth a visit. Then on to stay at Roma. This little town was settled ages ago by Roman Catholics hence the name. While here we do a walk to see some dinosaur footprints. Quite amazing. Now we head further into the Lesotho highlands where you can really see just how mountainous Lesotho really is. We visit Katse dam which is the highest dam in Africa at 2400m above sea level. A tour of the dam wall is very interesting. Finally, we drive to the famous Sani pass. The chalets here are great. To finish the tour of Lesotho we drive back into South Africa down Sani pass. 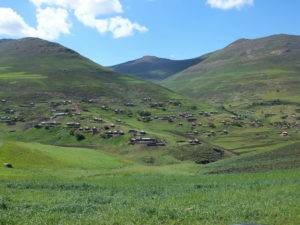 We also love to visit Lesotho in the summer. This time we rather camp. It is warmer and we get to see some of the really wild parts of Lesotho. Just over 4 days we drive up Sani pass to camp wild near a beautiful mountain stream. After sleeping under a million stars we head on to stay at Katse lodge. Just 1 night of 'luxury' for those that can't miss out on a hot shower. The tour of the dam wall should be done and there is a lovely botanical garden nearby. Now it is time to head back into the wild. We drive to camp under huge Poplar trees at the bottom of Matabeng pass. Matabeng pass is a great 4x4 drive. We leave Lesotho via Ramatseliso's gate and fill up in Matatiele in South Africa. Please click here to contact us about Overland 4x4 Tours of Lesotho and other Southern African countries you will be directed to this tour on our sister website, Southern Africa Overland 4x4 Tours.